Washington, D.C. The one city that affects all our lives. The one city where the game has only one name: Power. It’s hard for anyone outside “the beltway” to know just who wields the power and why. The Pulitzer Prize-winning, ex-Washington bureau chief of The New York Times, Hedrick Smith, not only takes Americans inside their power structure and shows the way play it, but takes a hard look at rising young politicians. 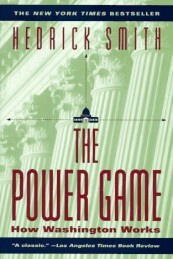 The Power Game explains how Deaver and Baker kept Reagan out of trouble, how Reagan power-surfed, how Jesse Helms and Howard Metzenbaum wielded ‘porcupine power’ by being prickly, how the military services play turf games in the Pentagon, how insiders and “leakers” use the Times and The Washington Post as their personal bulletin boards, or how Nancy Reagan could maintain a close friendship with the Post’s liberal publisher. Congressional staffers more powerful than their bosses. Media advisors more powerful than the media. Money that not only talks but intimidates. That’s Washington. That’s The Power Game.